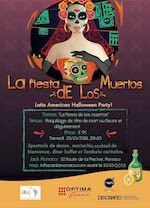 A Latin American Halloween party with dance show, mariachis, welcome cocktail and buffet dinner. During the evening there is a charity tombola to raise funds for Chilean association Somos Huellas, which provides aid to Venezuelan migrants. Organized by the Association Monegasque for Latin America. For more information email info@amlamonaco.com and visit the organizer's website at: AMLA Association Monegasque for Latin America.